After months of screenings and regional competitions, the official contestants of Misters of Filipinas 2017 were finally introduced to the members of the media on September 17 at Matrix Creation Events Venue in Quezon City. This year’s roster of contestants from around the country and Filipino communities abroad is composed of models, engineers, nurses, entrepreneurs, among other occupations. 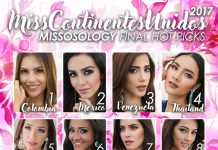 They are all setting their sights in winning one of the coveted titles and representing the country in international pageants. Carlo Pasion of Laoag City was voted as the Media’s Choice at the conclusion of the event, which saw the contestants parade in official Misters shirts, resort wear, and swimwear by Lemuel Rosos. A string of activities that is aimed at developing the skills and characters of the contestants has been scheduled by organizer Prime Event Production Philippines (PEPPS) Foundation Inc.
Last September 16, the contestants had their official swimwear and formal wear shoots with lensmen David Fabros and Raymond Saldana. They will also have their fitness challenge, ethnics costume and talent show before travelling to Laoag City in Ilocos Norte for the preliminary competition. The finals is set for September 30 at One Esplanade in Pasay City. As Misters of Filipinas marks its fifth year, PEPPS president Carlo Morris Galang reiterated the organization’s slogan of “Masculinity With Responsibility”. “More than having a handsome face and a gorgeous body, every man who has passed through Misters of Filipinas and Man of the World should have developed a sense of community and have evolved in becoming the best versions of themselves so that they contribute to society,” Galang said.